Getting ready to take possession of a newly built engine with a Weiand 144. He is a friend of mine, and I trust him. He's had this supercharged 355 for a year now (he didn't build it). Normal driving it uses no oil, but at highway driving (higher RPMs) he's losing a quart every couple hundred miles! He's been all over that engine, and only can find some slight oil dampness at the valve covers and some "oil mist" on his hood. He has gone from a PVC type ventilation, to 2 breathers on the valve covers, but no change. He's had people follow him down the highway, and there is no visible smoke to indicate it's burning through the cylinders. He runs 80 lbs of oil pressure, 40# at idle, seems kind of high. We are stumped! We wonder if the crankcase has too much pressure. He said it's almost like it's vaporizing the oil since he can't seem to find any major leak. How are these things best ventilated? He admits it's a trailer queen, and the boost is set for max with the pulleys. I will detune with other pulleys, will that help? What to start looking for or to do? What to start looking for or to do? Application: 383 Chevy 1997 Camaro MM6 trans 12 to 15 lbs boost press. ProCharger centrifugal F1A. 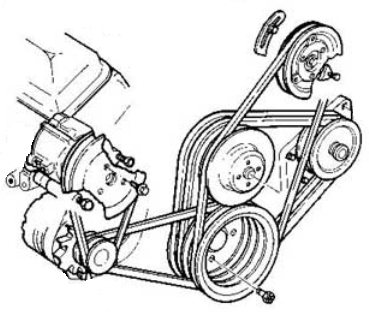 7.6 to 3.4 pulley driven. Tried many fixes. I had oil getting dirty fast. You may have this also. Oil mist flow due to positive crankcase pressure. Ring blow-by was the problem. The top to bottom pressure difference allowed for the rings to seal much better. Couldn't solve it until I went to external crank driven vacuum pump. This helped the rings to seal. Now, no problem. PCV system is gone. Designed to run on 1/3 ATM crankcase vacuum (5 psi vac). Van regulator. I use a vacuum pump manufactured from west coast. GZMotorsports.com. No vanes. It has a Rulon plastic wipers that have long life. His pumps are very different from the typical vane type. Been running for 8 years. Hope this helps. B.
I believe most forced induction engines (N2O applications too) should eventually install a crankcase vacuum pump. I run a Moroso Enhanced Design 4-vane crankcase vacuum pump (no crank mandrel), and I can't imagine not having it. I run a large self draining catch can hooked up to the PCV system. My oil consumption is minimal. It took a bit to route the lines in a manner that prevents oil from exit. Blowby is what it is. The larger ring gaps needed to keep a blower engine alive causes more blowby to occur, especially under boost. I'm not boosted, but I was having a problem with oil leaks. I was running a conventional PCV system with the PCV in one rocker cover and a vent in the other. I have a MAP sensor on my crankcase and this system does nothing to reduce crankcase pressure, so I made some changes. I put a fixed orifice PCV in the one rocker cover and on the other rocker I put a restriction in the vent line going to the breather. I played with the sizes of the orifice in the vent line and the PCV until I was getting around 7" of vacuum in the crankcase. Then I added an electric smog pump to the rocker cover that has the vent line on it. I then put a one way check valve on the PCV line so vacuum would only flow to the intake and pressure from the intake could not flow back into the crankcase. I also added a check valve to the exhaust side of the vacuum pump to stop any vacuum in the crankcase from leaking. So as I am driving around under normal conditions the crankcase is under vacuum from the intake, and as I go to WOT and intake vacuum drops, my ECU will turn on the electric vacuum pump. The electric vacuum pump is capably of holding 5.5" of vacuum in the crankcase at WOT. As a result of these changes, I no long have any oil leaks. Last edited by 81 TransAm; 02-07-2019 at 09:15 AM.